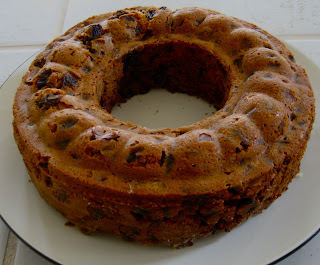 Here's a fruitcake your friends won't "re-gift" or use as a doorstop. Every year I bake it for my children's families and ourselves. It's not the kind you make in October and keep pouring the Napoleon brandy into every so often, although you can do this if you want. It all started because I can't eat the multi-colored citron you find in stores at this time of year. They are all preserved with sulfur dioxide. I'm allergic to that. It gives me migraine. A few years ago, I discovered non-sulfide mango spears. I had experimented with substituting dates, prunes and nuts, apples. They were all good, but not quite the texture I was looking for. So, one year I put in the chopped mango and Voila! --perfect fruitcake. I don't give this recipe to just anyone, mind. In a saucepan, combine orange juice, molasses and raisins and heat until bubbly. Simmer 5 minutes and cool. In a bowl or mixer, cream butter and sugar. Add eggs. 2 loaf pans, greased and floured, or one large tube pan. Place in the lowest shelf of the oven and bake at 275 degrees until a toothpick inserted into the center comes out clean. --About 1 hr. for tube pan, 45 minutes for the loaf pans. Cool and put in air-tight container (add brandy if you choose after 1 day) or wrap in plastic wrap until ready to eat.